This contest started on 3/27/19. This contest has a winner. * Win A $20 Pizza Time Gift Card. Jeff Eats got a $20 Pizza Time Gift Card to give to one of you guys! The $20 Gift Card is good at Pizza Time, 1001 Southwest 2nd Avenue, Boca Raton, Floria 33428, (561) 391-9240. Check pizzatime.restaurantsnapshot.com for menu/prices/info. ***** DISH OF THE WEEK (Sunday- 11/4/18- Pizza Time). Trust Jeff Eats when I tell you, Pizza Time is a terrific mom & pop red sauce Italian joint! If you live, play, work anywhere near Pizza Time- do yourself a gigantic favor and give the joint a shot! By the way, I picked Pizza Time’s chicken parm just to get the discussion going- I’ve been eating there for years and can’t recall even one time when its food wasn’t absolute dynamite! ***** Pizza Time, 1001 Southwest 2nd Avenue, Boca Raton, Florida 33428, (561) 391-9240. Jeff Eats and Mrs. jeff Eats have been eating at Pizza Time- in Boca Raton for something like 9 years- last night we shared an absolutely delicious large sausage/pepperoni pizza and some other dynamite stuff and Mrs. Jeff Eats “mentioned” that I should remind you guys as to how good this joint’s food is! So here you guys go! Trust Jeff Eats on this one, Pizza Time in Boca Raton is an absolute must try joint! Anyway, last night “we” got together and Jeff Eats knowing I/he was going to be picking up the check- took them to Pizza Time which is one of my favorite-reasonably priced “mom and pop” red sauce Italian joints (which by the way is 3 minutes from the Boca Raton Resort and Club) for dinner! Not much more to tell you guys, other than Jeff Eats has been eating at Pizza Time since 2008, the joint makes outrageously delicious food and it’s probably no more expensive than your favorite “mom & pop” red sauce Italian joint! For those of you who maybe wondering- large cheese pizza, veal parmigiana, chicken parmigiana, veal marsala and meatballs & spaghetti- and like I said before, outrageously delicious food- and Jeff Eats didn’t have to “consult”- an ATM Machine to pay the bill! If you haven’t eaten in Pizza Time in Boca Raton…GO! You will really-really enjoy this joint! Pizza Time is open, Monday-Saturday 11:00 AM – 10:00 PM, Sun 12:00 PM – 10:00 PM. ***** Pizza Time, 1001 SW 2nd Avenue, Boca Raton, Florida 33428 (561) 391-9240. Rather than rehashing the details…suffice it to say, that the guy who originally owned the Pizza Time in Coral Springs sold the joint and has now “resurfaced” in Boca Raton (in what was formely Sal’s Italian Restaurant) in a new Pizza Time. This “newest” Pizza Time is terrific. It is as good as the original Coral Springs’ joint. Great pizza, pastas, meat/seafood/chicken entrees. Pizza Time is open 7 days a week for lunch and dinner. ***** Pizza Time, 11504 West Sample Road, Coral Springs, Florida 33065 (954) 753-7828. If you live in Coral Springs you probably know all-about Pizza Time…the joint is or should be a landmark. 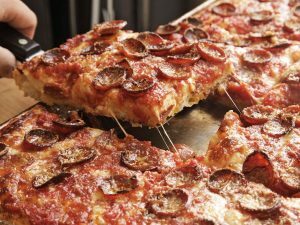 Rather than beating around the bush, Pizza Time is one of the best “mom and pop” Southern Italian Red Sauce joints in all of South Florida. There is nothing fancy whatsoever about Pizza Time…terrific pizza, pastas, fish-seafood, chicken and veal-meat entrees. Good prices. This joint is open 7 days a week for lunch and dinner. While you are waiting to get in, checkout the takeout business that Pizza Time does. Pizza Time’s website is at www.pizzatimeinc.com. By the way, in Parkland there is a joint called Pizza Time Caffe, 6620 Parkside Drive, Parkland Florida (954) 345-8665. Rather than going into lengthy detail (because I have forgotten the whole story), this joint was in the past somehow connected/related to the original Pizza Time Italian Restaurant, but isn’t anymore. Anyway…I just wanted to let you know, that this Pizza Time Caffe isn’t half-bad. As a matter of fact it was pretty good the 2 times that I tried it. So you now have two joints for pizza etc., in the Coral Springs/Parkland area to choose from…the Pizza Time Caffe website is at www.pizzatimecaffe.com. It’s been on my list to try. I have eaten in both the BOCA and CORAL SPRINGS restaurants and both locations had delicious food, though the BOCA restaurant’s food was better. Great place. Pizza is tough to beat. I need to be chosen! They make a delicious chicken parm and veal parm. Both are baked, not fried. Ive eaten there at least a dozen times. Outstanding food. A few years ago, I went to the Coral Springs location to buy a gift card for my daughter’s teacher. When I opened the door to the restaurant, the smell of the food brought me to my knees … in a GOOD way! It smelled delicious. Hope this is my opportunity to get a gift card of my own. I’d love to be selected! This is the best pizza joint in Boca Raton. Their food is amazing. An absolute must try. Than you very much for the Gift Card.